You are currently browsing the Columbia Hearing Center blog archives for September, 2012. Antioxidants, dietary supplements, and brain imaging are among some of the new strategies being used to help detect, treat, and prevent noise-induced hearing loss (NIHL) and tinnitus among American troops, according to researchers atHenryFordHospitalinDetroit. The research team, led by Michael Seidman, MD, is the first to identify how acoustic trauma from machinery and explosive devices damages the inner ear cells and breaks down cell growth, much like age-related hearing loss. Seidman will also discuss the use of nutraceuticals, such as acetyl-l-carnitine, alpha lipoic acid, and resveratrol, a substance found in red wine and red grapes, to mitigate hearing-related issues. Based on initial results of the team’s research, Seidman says a nutraceutical with a resveratrol-based component may hold the potential to not only prevent, but reverse hearing loss in certain circumstances for soldiers. This research is based on animal models, but will soon be tested with humans to see if a pill could be developed to prevent acoustic trauma in troops. In addition, Seidman will highlight new research on tinnitus. A study co-authored by Susan Bowyer, PhD, senior bioscientific researcher atHenryFordHospital, found that an imaging technique called magnetoencephalography (MEG) can determine the site of perception of tinnitus in the brain, which could in turn allow physicians to target the area with electrical or chemical therapies to lessen symptoms. New Hearing Aid With Some Bite Receives FDA Clearance. 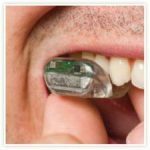 SoundBite, a new device that’s as novel as it’s name, is the world’s first non-surgical and removable hearing solution designed to imperceptibly transmit sound via the teeth to help people, who are essentially deaf in one ear, regain their spatial hearing ability. It employs a well-established principle called bone conduction (vibration of bone) to deliver sound to the inner ear. The SoundBite system consists of an easy to insert and remove ITM (in-the-mouth) hearing device — which is custom made to fit around the upper left or right back teeth — and a small wireless microphone worn behind the ear which picks up the sound. No modifications to the teeth are required. This system currently has FDA 510(k) clearance to treat single sided deafness. Intended future indications include conductive and mixed hearing loss. The device was found to be safe for long-term use as there were no medical, dental, or audiological adverse events after six months wear of the SoundBite system. The removable In-The-Mouth (ITM) device showed no long-term effects on dental or periodontal soft or hard tissues. The device was worn on patients’ natural teeth, as well as on those with fillings, restorations, crowns, root canals, and dental implants.